Nothing in the world is permanent, and we're foolish when we ask anything to last, but surely we're still more foolish not to take delight in it while we have it. If change is of the essence of existence one would have thought it only sensible to make it the premise of our philosophy. We can none of us step into the same river twice, but the river flows on and the other river we step into is cool and refreshing too. 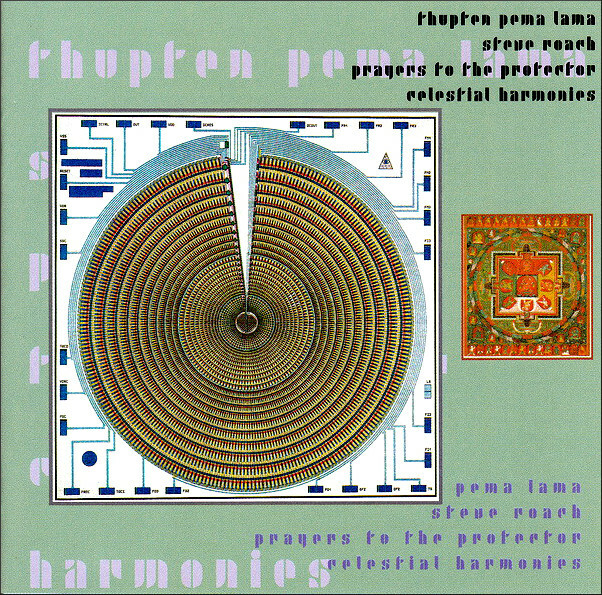 Impermanence is also a central tenet of Buddhism and the image shows the CD 'Prayers to the Protector', a collaboration between ambient pioneer Steve Roach and Tibetan Buddhist monk Thupten Pema Lama. That distinctive artwork uses the graphic 'Diagram of Neural Net Microchip' from the Museum of Modern Art, New York, and the Mandala of Raktayamari from Tibet dated c.1400. 'Prayers to the Protector', which juxtaposes Buddhist chants with ambient electronics, was created, to quote the sleeve essay, because "Thupten Pema Lama felt that Westerners and young monks taking [Tibetan Buddhist] into the 21st century would benefit from hearing [the chants] in an updated setting". For those readers not interested in the metaphysical context, think different trains for different brains. The album was released in 2000 on the Celestial Harmonies label; a biography of the labels's visionary founder Eckart Rahn can be read via this link. An earlier post quoted Steve Roach as explaining that the essence of music is what is felt when it ends and returns to silence. Which is appropriate, as On An Overgrown Path now returns to silence as I am travelling to the East again. * The quotation, which was translated by Christopher Isherwood, is "The sharp edge of a razor is difficult to pass over; thus the wise say the path to 'enlightenment' is hard". Comment moderation will now be delayed. New Overgrown Path posts are available via RSS/email by entering your email address in the right-hand sidebar. Any copyrighted material is included for critical analysis, and will be removed at the request of copyright owner(s). Nice blog. Do you ever try Buddhist Mandala art? This art is a brilliant Buddhist art work. There are different designs for example mandala elephant designs.